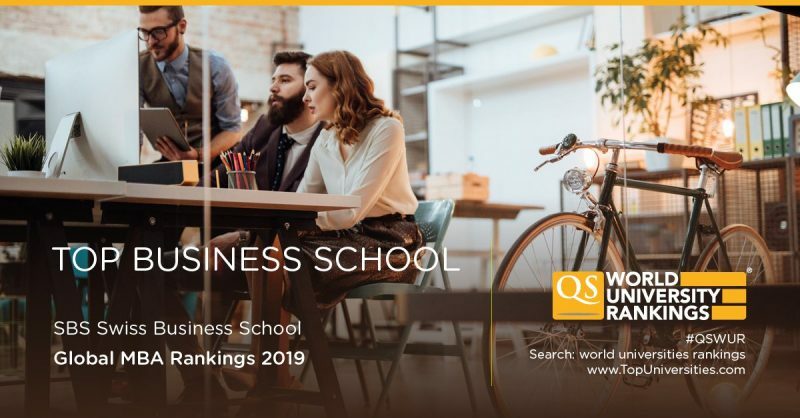 SBS Swiss Business School in Zurich, Switzerland > The QS 2019 Global MBA Ranking Are Out! The QS 2019 Global MBA Ranking are out! A total of 251 MBA programs from 37 around the globe are included in the QS 2019 Global MBA Rankings. We are proud and happy to announce that SBS Swiss Business School has been ranked #141-150 on a global level, with a score 54.8 out of 100. The MBA programs have received best scores for Employability, ranked #33 globally and Diversity, ranked #39 globally. Employability reflects 40% of the total ranking score. For this indicator, the MBA programs at SBS have received a score 52.8 out of 100. This score reflects weighted averages of 46 on employer reputation and 100 on percent of graduates who have accepted job offers within three months. SBS Swiss Business School received a score of 79 points in diversity of student body and faculty. This score reflects weighted averages of scores earned in the share of female students (100), the number of nationalities in the classroom (30). In the regional ranking of the QS Global MBA Ranking, SBS Swiss Business School is ranked #44 in Europe for the MBA programs. Out of 74 MBA programs from Europe that are included in the 2019 Global MBA Rankings, we earned a rank of 44th overall with a score of 54.8 out of 100. Our programs scored highest in Diversity (79). This score is higher than regional mean scores.